+1....ugly to me but might look better in the wild. So true, many times I thought I wouldn't care for something until I saw it in person. The grab handles are a good example. They look kind of cool in person, not at all what I thought when I first saw them in pics. And the way the MBUX screens float in front of the dash looked odd in pics but looks nice in person. So these AMG GLE 53 wheels will probably look better in person as well. I love the look of the Panarama grill on the AMG GLE 53. I would option one of those on my current build if it was available. But as Greg pointed out, this is halfway to a true AMG and they have to reserve some things for AMG-only cars. Hey Greg, our Multi-Spoke wheels look terrific in person, better looking than those new AMG 53 wheels IMO. You and your wife will be very happy. The rear tires are very wide looking! Here is the full press release for the 53. On sale "late 2020." Fixed brake calipers front, floating rear. Would like to retrofit the metal shift paddles (if not also the steering wheel) to my 450! Standard on the 450, too. If 53 won’t have E ABC maybe if you are looking for comfort 450 will be the way to go. I can only theorize suspension comfort from least to best: 1) steel springs; 2) Airmatic; 3) Airmatic with active antiroll bars; 4) E-ABC. The advantage of the last two is roll control, thus side-to-side connection, is minimized when traveling straight. E-ABC is not standard, as I read it. 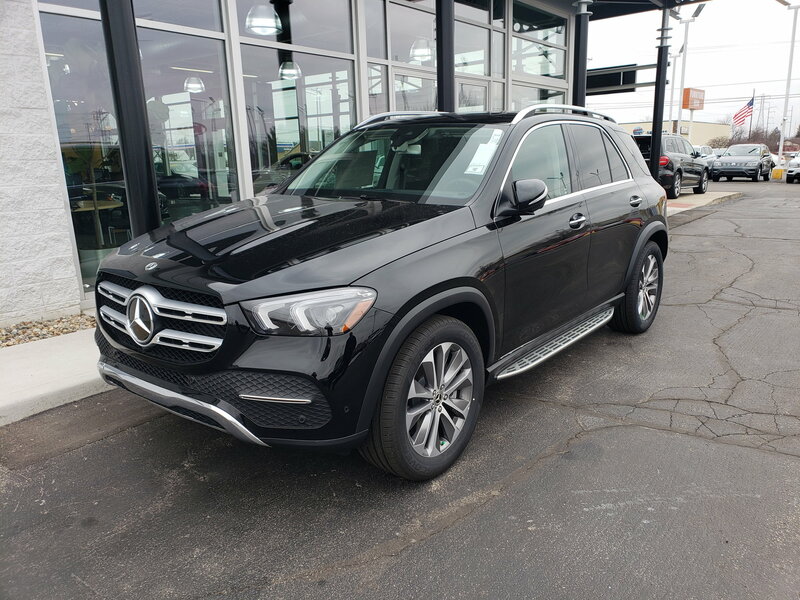 Sounds like Active Curve which I have on my '12 ML and is available on the GLE 400 at $2,910. I would have gladly got this instead of E-ABC for its lower complexity. Current GLE 400 > GLE 43 difference is $12,450; I expect similar for this iteration. 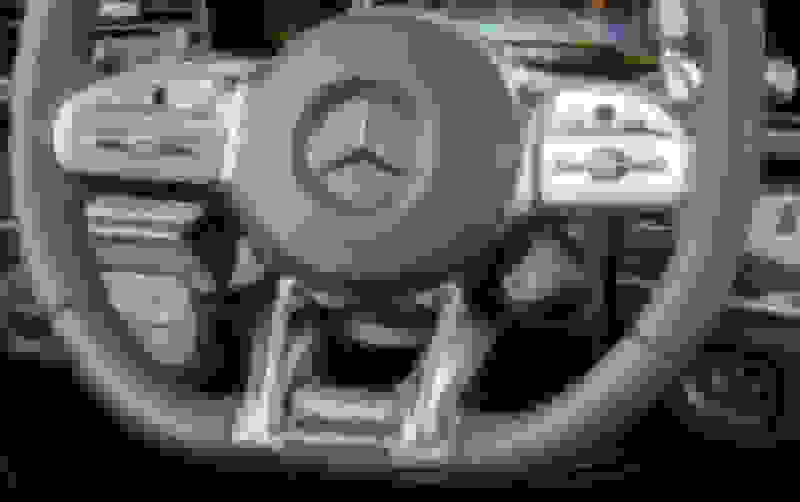 What is the price difference of the CLS 450 and the CLS AMG 53? Here in Sweden its about 31000 US$. It should be similar for the GLE. 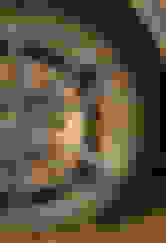 I was referring to the image itself. My 3 year old GLS has mirror logo projectors but the image is different. 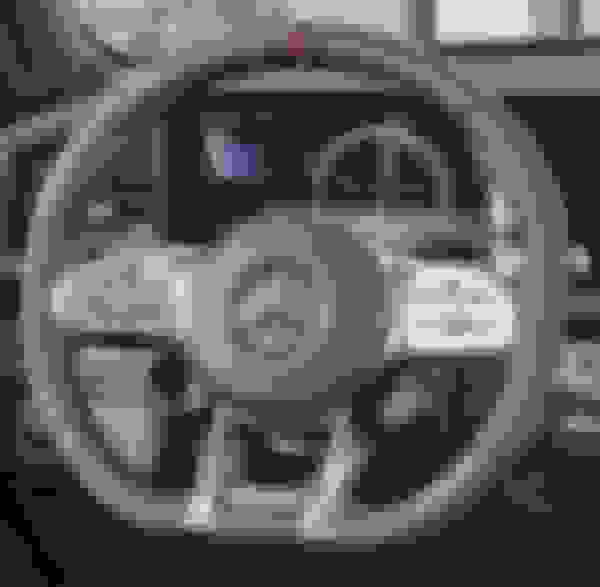 The AMG 53 image shown is nicer looking than mine. Hopefully our 450 has the same image. I've been wanting to post my thoughts about the new GLE steering wheel designs, they no longer offer the stitching that was used on past models. Our 17 GLS 550 has stitching and looks great IMO. What are your thoughts about the new more generic looking center cover? Like it or would rather have the stitching? Even the new AMG 53 steering wheel doesn't have the stitching. 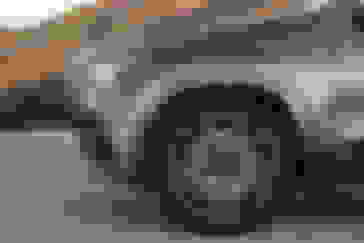 The center hub cap stitching looks fake (as it is) in that example. 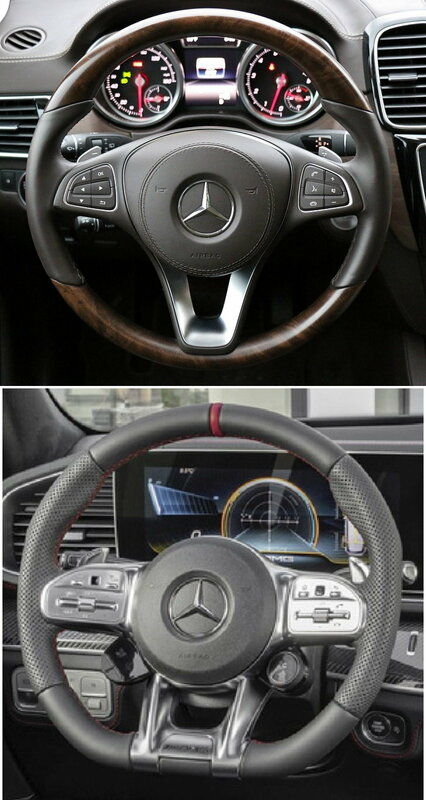 More important I think is the stitching on the inside of the rim of the AMG wheel. Wasn't expecting late 2020. That would make it a 2021 model. Interesting. Well over a year from now? Makes me think that is a typo. Yeah they are definitely doing something different because the GLE53 is way over a year away. Hard to believe, but C&D just confirmed it in their article also. I would be that the GLE63 gets introduced and goes on sale before then, but who knows at at this point. GLE53 is a 2021 model, bizarre. wow so weird.. maybe a publication like C&D will ask one of their execs one of these days why the extended roll out. Last edited by bonboon; 02-27-2019 at 02:23 PM. Car and Driver says it does not come with standard with E-ABC. Last edited by Ron.s; 02-27-2019 at 02:39 PM. E-ABC or Active Curve on GLE 53? AMG instead plucked the GLE's conventional Airmatic air suspension—which is still height adjustable and self-leveling—with firmer springs and stiffer adaptive dampers. The GLE53 lowers itself by 0.6 inch in the Sport and Sport+ driving modes and in Comfort mode above 75 mph. I mis-read your statement and missed the NOT! 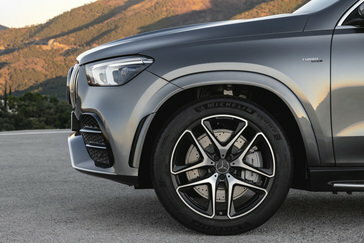 Based on this I think it does have what is currently called Active Curve, "A new feature makes a significant contribution to the AMG-specific tuning for high levels of driving dynamics: the active roll stabilization with two electro-mechanical actuators working independently of one another on the front and rear axle..." Motor1 confirms that, "The GLE 53 comes standard with an air suspension that features active roll stabilization for keeping the crossover flat through corners." Last edited by GregW / Oregon; 02-27-2019 at 03:13 PM. I wonder what those small switches at 4 and 8 o'clock are supposed to do? Or are these already on the 350s and 450s. One of them seems to have a fan symbol. Last edited by Shrdlu; 02-27-2019 at 03:05 PM. There's already a GLE 53 thread started by Ron. Post GLE 53 comments there please. Here is a better pic. 2 switches on left, one to raise the vehicle. One rotary knob on right, probably Adaptive Damping mode adjustment. tech is included (blind spot, etc..). I have added amg exterior, so need to economize somewhere (yeah, I know, economizing would be keeping the 2018 gle I have, sigh...). Some, like RustyBear3 & Streamliner in another thread will disagree with me, but my typical driving does not require all the "nannies" and semi-autonomous features. I actually like to drive and not be driven! I would probably usually keep most stuff off. Maybe for a long trip some features might be useful. Something is wrong with this statement, "The large size high-performance braking system slows down the performance SUV even with heavy loads and short braking distances. 400 x 36 mm internally ventilated and perforated integral brake disks are used on the front axle as well as 2-piston fixed calipers, painted silver with black AMG lettering. On the rear, the internally ventilated brake disks measure 345 x 25 mm and have a 1-piston floating caliper." 1) The F brake calipers look exactly like the AMG Line 450's except for the AMG lettering and the rotors are the same size at 400mm; 2) Fixed calipers have twice as many pistons as similar floating calipers because there is a piston on each side of the rotor; I've never heard of a two-piston fixed caliper, as it does not make any sense. You have 4 at minimum, if not 6 or 8. 3) And, that's not what fixed calipers typically look like (see 2nd pic of optional Euro 4-piston fixed calipers). So, either the vehicle pictured does not have the real brakes, or the description is messed up, IMO. "Thank you for your contact and feedback regarding the 2020 GLE53. From the information we have, the specs provided are correct but the pictures may not represent the production model. We will have additional information added to www.mbusa.com once it is available. We appreciate the opportunity to respond." Well, I initially thought all the nanny stuff would be good as I age, but I think the backup cameras and the blind spot assist are the most useful things I have on current gle. Just took one gorgeous black GLE 450 for a test drive. It had parking assist, 20 inch 10 spoke wheels and augmented video. Not fully loaded, was roughly around $68000. This thing drives amazing and handles well. It was a short trip but will definitely go for a more detailed look and place an order soon. GLE 450 2020 black/black 2 row augmented reality park assist 20\"